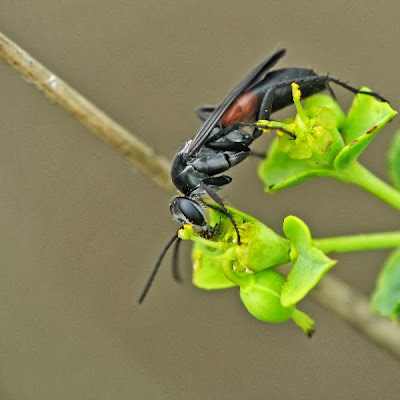 The wasp in the photo above (taken by Henrik Gyurkovics) is Telostegus inermis, a member of the family Pompilidae. I've always known pompilids by the vernacular name of spider-hawks; other names I've heard include spider-hunters or tarantula hawks. They get these names because the females capture spiders that they paralyse with their sting. The helpless spider is then dragged into a burrow, where the spider-hawk lays an egg on it. When the egg hatches, the spider will become food for the developing larva. Spider-hawks of the genus Telostegus are known from the greater part of the Old World. Normally, at this point, I would say something about their distinguishing characters, but I'm afraid that you've got me there. A morning spent trying to dig up descriptions has largely failed, with the necessary references being scattered and inaccessible to yours truly. Though spider-hawks are among the more visible of wasp families, they have not been that extensively studied. Indeed, one of the first things I came across in my search was this dis-heartening exchange discussing how there was (as of 2009) only one researcher in Europe with the experience to reliably identify pompilids, who is difficult to contact due to failing health. Sadly, this is a scenario all too familiar in the world of taxonomy. The nesting behaviour of three Australian Telostegus species (one under the since-synonymised genus Elaphrosyron) was described by Evans & Matthews (1973). Each built nests in which a single entrance lead through branching tunnels to multiple cells, each containing a single spider. In at least one species, Telostegus socius, the soil from the burrow was piled in a mound in front of the entrance. Evans & Matthews also noted that another pompilid species, Ceropales ligea, would sometimes lay its own eggs on the Telostegus' spider as the female of the latter was in the process of transporting it, making C. ligea a cuckoo pompilid. The name of Telostegus socius refers to another characteristic of its nests: a large number of females would build their nests in close proximity. Such gregarious behaviour is also known from wasps in other families (such as the sand wasps of the crabronid genus Bembix). It does not represent true social behaviour like that of ants or vespid wasps, as each female is still constructing and stocking her own nest. Nevertheless, any would-be predators may now be faced with a whole group of defending wasps instead of just one, and it is tempting to see such gregarious nesting as an early step towards true social behaviour. Evans, H. E., & R. W. Matthews. 1973. Behavioural observations on some Australian spider wasps (Hymenoptera: Pompilidae). Transactions of the Royal Entomological Society of London 125 (1): 45-55. Pity that such an interesting group of wasps with fascinating biology, wonderful morphology with some S. American forms sporting metallic blues and green, epic battles with their prey and some seriously sized species that go after equally seriously sized megalomorph spiders, can suffer a such a dearth of students. Most texts will put them as vespoids with a transverse sulcus on the mesopleuron, relatively long legs, females with curly antennae that are moved rapidly.